Camera SD SDHC SDXC to High-Speed Extreme Compact Flash (CF) Type I Memory Card Adapter : allputer.com - Accessories for all your Portable Electronics & Computers! 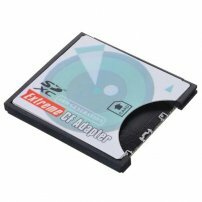 - You can put the SD card to Device with CF Card Slot! - Need CF type I slot. 3.3mm height CF card No Memory card in the package. - Compatibility Check: Please refer to your product's documentation to confirm maximum supported capacity, and compatibility with SDHC memory cards (SDHC, miniSDHC, microSDHC) before purchase.